A Better Maryland is a dynamic, evolving plan that provides a framework to support a thriving economy and environmental stewardship. The plan supports collaboration among state and local governments and all other stakeholders, providing resources and tools for the long term economic success of Maryland. 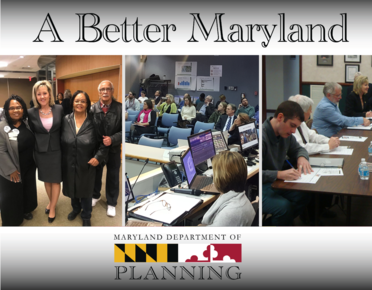 The Maryland Department of Planning is conducting a second round of community outreach for the new state development plan, A Better Maryland. Planning developed topics and strategies using input provided by participants in the first round of outreach for A Better Maryland. Additional stakeholders, including the Maryland Sustainable Growth Commission, the Maryland Chapter of the American Planning Association, the Maryland Municipal League, the Maryland Association of Counties, and Maryland state agencies, assisted in this effort. You can view first round input on Planning's website at the What We've Heard page. Please consider attending one of our public meetings being held through the middle of November. Please share this with your associates, friends, neighbors and co-workers. Post to your social media (e.g. Facebook, Next Door). Together we will develop the new state development plan, A Better Maryland.